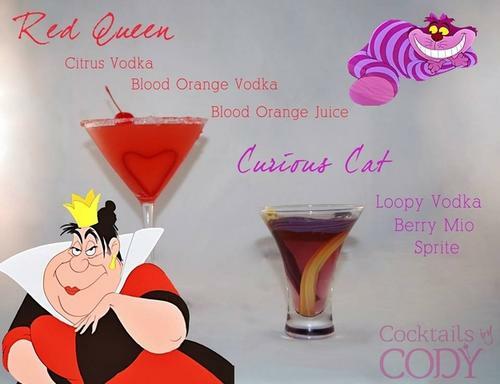 Cocktails by Cody are inspired by Disney's most beloved characters from princesses to hero and sidekicks and even villains. Each one is mixed with a little magic. These unique and creative cocktails call to the child in each of us and bring back sweet memories from our favorite childhood movies. An e-book is scheduled to be released in the near future with the complete collection of Disney cocktails recipes. Until then, you can admire them and attempt to recreate these evil drinks at home to sip on something scary on Halloween. 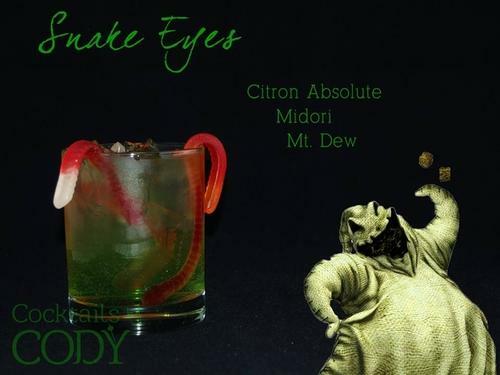 Bright green and stuffed with creepy crawlers, the snake eyes cocktail is modeled after the Oogie Boogie man from The Nightmare Before Christmas. This citrus flavored drink has a sweet undertone that's made even sweeter with the addition of gummy worms. There are three things that define Captain Hook: his jet black beard, red coat and intense fear of crocodiles. This layered cocktail captures all three into one delicious drink. Jafar is dark and mysterious so a cocktail inspired by him should be too. This drink is on the sweeter side but don't be fooled as it packs a punch from the rum. 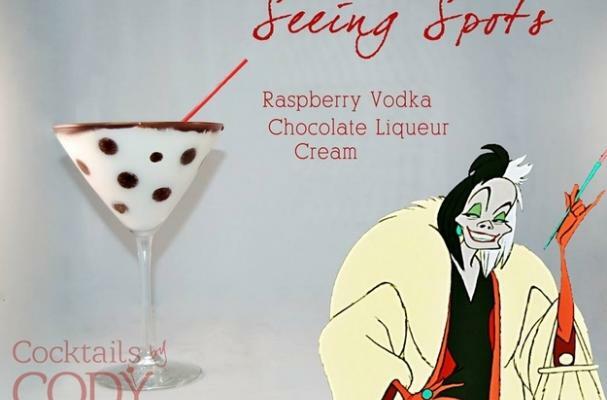 Cruella De Vil's obsession with animal print is captured in the seeing spots cocktail. The glass is rimmed with chocolate syrup before the chocolate chips are glued on with corn syrup. The milky white beverage is made with a combination of raspberry vodka, white chocolate liqueur and half and half. One of Disney's most malicious characters, Maleficent, is portrayed perfectly in the cocktail of the same name. Black vodka is layered with grape schnapps and apple pucker to create a three tiered effect. The Queen of Hearts is obsessed with red so naturally she needs a cocktail that would match. The red queen is shaken with a combination of citrus vodka and blood orange vodka along with a splash of blood orange jucie. The Evil Step Mother offers a bold and flavorful counterpoint to the Cinderella inspired cocktail, the glass slipper. This deep red drink is bitter from the pomegranate but has a smooth chocolate finish. Aside from Ursala's unique and iconic voice, you cannot escape her trapping tentacles. 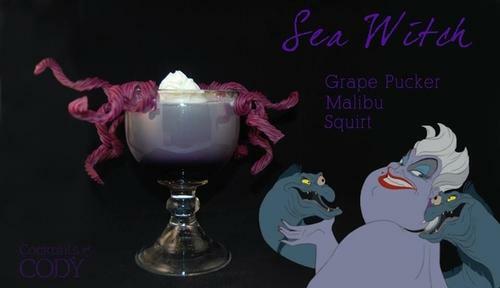 Likewise, her purple cocktail has its own set of tentacles spilling from the glass.